Jaya Bahadur Rawat  lives in one of the poorest and most remote villages of Jumla, western Nepal. The landscape is mountainous and the weather is often rainy and cold. The land is difficult to cultivate so growing enough food all year round is very difficult. It’s a five-hour walk from Juma to reach Muchaldeu Village where Jaya struggles to support a family of seven. Like the majority of those in his community, Jaya has not had the opportunity to attend school and many of the men in his village are forced to travel to India in search of work. A lack of education around sanitation has caused huge health problems across the community. This is where INF’s work began when it began working in Muchaldeu Village facilitating two Self-Help Groups. Jaya recalls there was initially a lack of interest in working for the common good of the village but slowly women have begun working together and sharing their concerns. Some of the men were unhappy about their wives attending meetings as they felt it would disrupt the daily routine within households. However, Jaya says it was not long before the entire community benefited from the newly formed groups. As the women shared their concerns and learnt about sanitation they began making changes across the community. 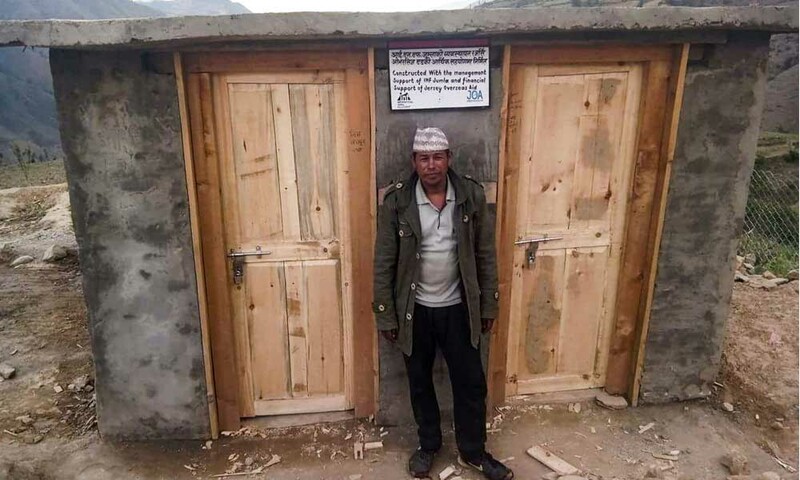 Bins were made and distributed throughout the village, the school of 200 students built its first toilet and taps with clean drinking water were installed. The women who were previously shy about speaking up now have the confidence to share their problems and be part of the decision making in the community. Jaya is the Chairperson of the School Management Committee and has seen first hand the huge changes made through these two groups.